Yesterday, February the 18th of 29483 I was looking for a new story, so I decided to walk around Borealis. The town has been very active since the illegal Omni-Tek occupation by force against the neutrals who lived peacefully there. As soon as I walked out of the whom-pah, I overheard a heated discussion, between neutrals no less. Apparently a few members of a neutral organization known as &quot;Department of Investigations&quot; and members of another neutral group &quot;Dragons of Death&quot; (including their leader) had some sort of disagreement which lead to the unexpected edge of violence between them. I immediately turned on my new press gear which I had recently acquired and also took my standard press card out and placed it around my neck. What surprised me was that an omni who identified himself as a member of Omni-Pol was backing up the DoI members. The following is the recording of what took place. Intrader: Oh no worries, we are just testing your resistance - your quarry, as we happen to know, is quite resilient himself. Streller: I see you seem to be examining our capabilities. Intrader: Wouldn't be of much use asking for an investigation if the subject in question would be above your capabilities, wouldn't it? Streller glances at Soldersam, and calmly nods. Noticiero: Excuse me gents... is there something going on here? Streller raises his weapon at Soldersam. Burkitt raises his gun towards Saphirafix. Streller: Sir, I advise against this. Noticiero: Lots of guns pointing, looks like a story to me. Yes dear readers, a gun was pointed at me, and it was a neutral doing it. Yes, I was surprised as well. Soldersam: hahaha its senior Validius. Validius: What would be the reason to hold Officer Streller at gunpoint? Intrader: What brings you here so far from RBB? Salivice: I was in the neighborhood. Intrader: Came to advertise the contest? Salivice: Heard there was trouble. Ah, an omni coming to the aid of the neutrals, how unlikely. But let's continue reading the log shall we? Noticiero: Have things deteriorated so much in the neutrals community, that they are pointing weapons at one another? are you being influenced by the illegal omni occupation of Borealis? Streller takes a deep breath and stretches his neck. Streller: We are private investigators sir. Streller: It seems the &quot;Dragons of Death&quot; dislike us. Noticiero: And what, if I may ask, are you investigating? 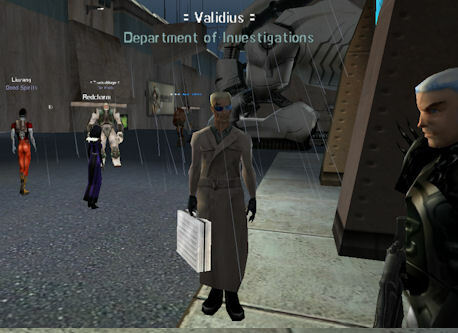 Validius: A variety of cases, sir. Salivice: Don't bother asking clanner. They wouldn't tell even if you had a good reason to know. Noticiero: Dislike, usually means you ignore a person, not point a weapon at them. That borders on hatred. Streller: There was no evident reason for this incident. We have never encountered them before. Noticiero: They appear to know of you however. Salivice: everyone knows who the DoI are. Noticiero: Well I have been on hiatus a while, so not very familiar with neutrals these days, except maybe Elite Operations. Validius nods to Streller and Burkitt. Streller reaches in his pocket and displays a badge to Noticiero. Noticiero: So, what do you investigate? cheating spouses? lost pets? Burkitt reaches into his pocket and pulls out a badge. Noticiero: Ah, nice shiny badges. Streller: Officer Streller. And that is Officer Burkitt. Salivice chuckles and pulls out his own badge. Streller: We investigate serious crime. Noticiero: Serious crime? since Borealis &quot;officially&quot; is omni territory, doesn't that falll under Omni-Pol jurisdiction? Streller: And situations relating to the safety of the public. Salivice: oi! Clanner! Guess what! they work across Rubi-Ka! Salivice: Now get lost mate. So here is when things get more interesting, I'm not doing anything illegal or wrong, and I'm being chased away by an omni who apparently is protecting these DoI members from my inquiries. Validius: That would be correct. Noticiero: Ah, the typical omni behavior, towards freedom fighters and anyone who is not an Omni-Tek drone... ehem, employee. Validius adjusts his tie in an unusual manner. His cold expression doesn't change. Salivice: I don't give a damn for your Rhetoric, Get lost. Salivice remains three feet from the nearest person. Noticiero: And with what... authority are you telling me to move? Salivice pulls out his Omni-Pol Affiliate Badge, flashing his Omni-Tek Issued Identification Chip. Salivice: The Authority of Omni-Pol. Get lost. Noticiero: Ah, another 'Pol pushing people around. Salivice: You got that right. Now Move it! 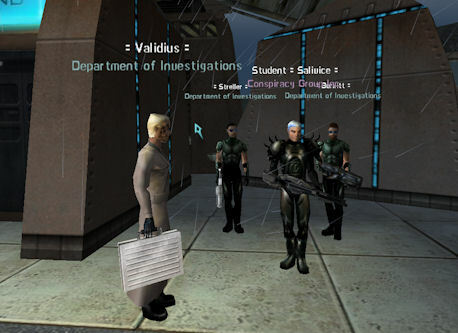 Validius: We are independent investigators, sir. A clear admission of collaboration with a neutral organization? what are the chances of Omni-Pol doing that? they don't work with neutrals, they work them, this is well known, otherwise Borealis would still be a neutral town. Noticiero: With the approval of Omni-Pol it seems, a sad discovery. You are helping those who illegally occupied Borealis, your town. Noticiero: Salivice, I will remember the name, for future reference. Streller: We assist anyone who requires our help, while remaining neutral. Salivice: You do that, clanner. So there we are. 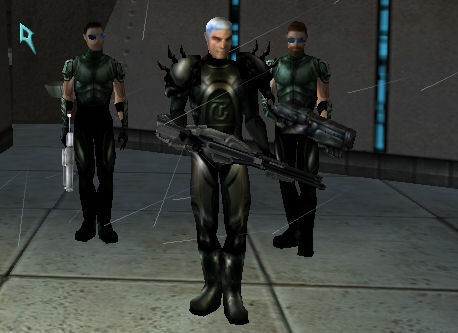 A group of neutral &quot;investigators&quot; working with Omni-Pol, and to be more precise under the protection of an Omni-Pol member. I wasn't looking for trouble, so rather than get shot down by an omni and having to wake up at some reclaim terminal, I left Borealis. I contacted Mr. John &quot;Saphirafix&quot; Blake to try see if they knew anything more avoid the DoI. I could hear some gunshots over the COMM and all he replied before cutting me off was &quot;fighting borgs&quot;. The other DoD members did not answer my calls. I thought about opening a channel to one of the DoI members, but then I've remembered Omni-Pol's way of making &quot;visits&quot; and &quot;interrogations&quot;. Is there some sort of hostility between neutrals because some are actually working with the omnis that forcefully took Borealis from them? It appears that way. Whenever Omni-Pol is involved, everyone with common sense knows that truth and justice is being trampled. Are these signs that the neutrals are slowly being swayed by omni propaganda, or are they bean cunningly deceived and perhaps gently pushed into the corporate ranks? The Department of Investigation members did not seem to be bothered at all by the omni who was quite friendly with them. If anyone has any information regarding this article, feel free to contact me. This is Noticiero Rivera, and this has been a Rubi-Ka Exclusive!